Did you know that the world’s first bra dates to the twelfth century? Or that wearing an 18th century crinoline was like having a giant birdcage strapped around your waist? Did you know that women during WWI donated the steel stays from their corsets to build battleships? For most of human history, the garments women wore under their clothes were hidden. The earliest underwear provided warmth and protection, but soon, women’s undergarments became complex structures designed to shape their bodies to fit the fashion ideals of the time. When wide hips were in style, they wore wicker panniers under their skirts. When narrow waists were popular, women laced into corsets that cinched their ribs and took their breath away. In the modern era, undergarments are out in the open. 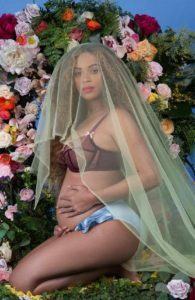 From the designer corsets Madonna wore on stage to Beyonce’s pregnancy announcement on Instagram, lingerie is part of everyday wear, high fashion, fine art, and innovative technological advances. 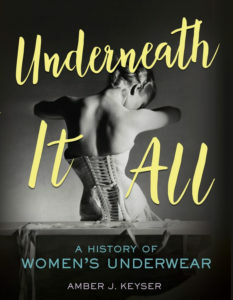 This feminist exploration of women’s underwear—with a nod to codpieces, tighty-whities, and boxer shorts along the way—reveals the intimate role lingerie plays in defining women’s bodies, sexuality, gender identity, and body image. It is a story of control and restraint but also female empowerment and self-expression. You will never look at underwear the same way again. Women’s underwear affords a natural subject with which to explore women’s self-image and the ways the male gaze has shaped it over the centuries. This slim, attractively designed volume traces what historians have deduced about underwear’s beginnings, and leads chronologically through farthingales, crinolines, corsets, and bustles into the disputed origins of the bra. A scandalous Victorian controversy centered on whether women should sew shut the crotches of their drawers. Keyser cleverly suggests that society feared women in pants. During World War II, the Betty Boop cartoon triggered a post-war explosion of sexualized “blond bombshells,” eventually cumulating in Madonna and Beyonce. The modern facts seem straightforward, except for a seriously incomplete identification of Mata Hari.